1. Pump coconut milk bath soak into a coconut cup and add water. Mix well and pour into the pedi basin. Soak the client’s feet. 2. Trim and file the nails, and push back/trim the cuticles. 3. 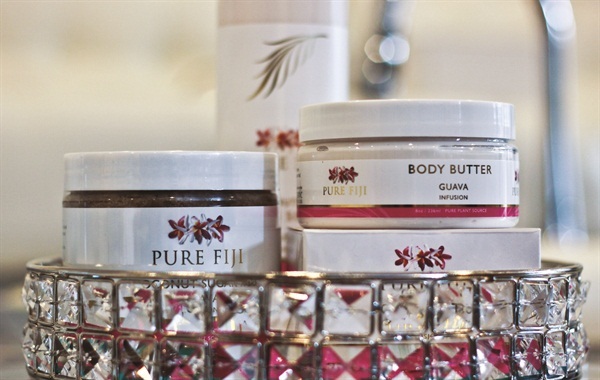 Apply Pure Fiji Guava Nourishing Exotic Oil to the feet and massage with hot stones. 4. Apply coconut sugar scrub along the feet and calves to remove dead skin. Use a pumice stone to erase any calluses. Rinse the legs and feet well. 5. With a fan brush, apply the body butter to the feet and legs. Apply hot towel wrap and let sit so the body butter soaks in to moisturize. 6. Remove the towels and excess lotion. Cleanse the nails and apply a base coat, two coats of polish, and a top coat. Tweak this Recipe: Use an alternate name such as Tropical Antiaging Pedicure, and offer slices of fresh guava, chilled guava juice or a guava mimosa.